Dartmouth's Big 3 overcame the depth and experience of Texas to win their first major event of 2017. 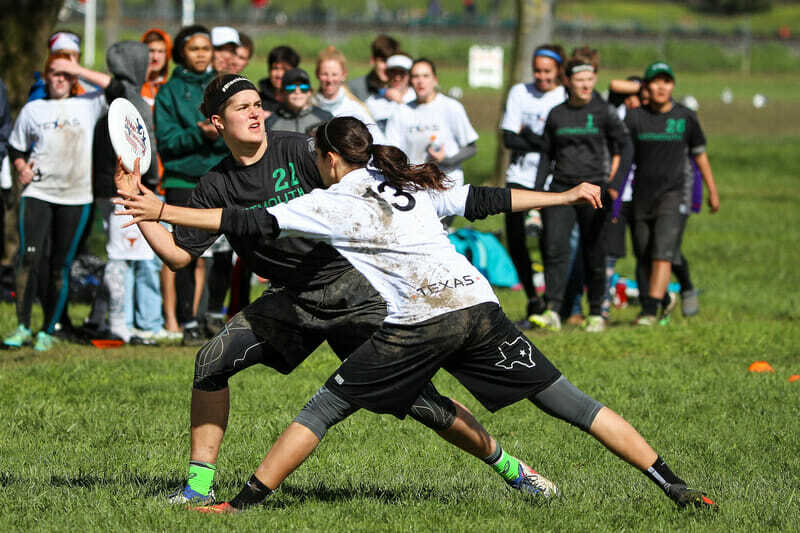 FREMONT, CA — With a powerful offensive performance from their stars, #4 Dartmouth Princess Layout took down #3 Texas Melee 13-11 in the Stanford Invite final to cap a dominant weekend and make a strong case to be the nation’s new top-ranked team. While Texas challenged Dartmouth more than any team at the tournament, their hard-working defense wasn’t enough to stop Dartmouth’s Big Three. Despite being the two most impressive squads at the tournament, the finalists navigated very different paths to Sunday’s finale. Dartmouth was basically unchallenged throughout pool play and the bracket; they allowed a total of eight goals across two bracket games before the final, including a dismantling of #1 ranked Stanford 13-5 in the semis. Texas, on the other hand, survived a double game point quarterfinal against #18 Michigan and another tough, close battle with #5 UBC in order to reach the final. The final opened the way so many points would: with Angela Zhu executing a difficult throw perfectly to a waiting Jaclyn Verzuh. Zhu threw four goals to Verzuh in the first half alone. In the red zone, even as Zhu would turn to her reset, her eyes would shift back to track where Verzuh was in the endzone. If the stall grew too high, Zhu knew exactly where she wanted to throw first. Texas answered Dartmouth’s opener with a hold of their own, and the teams traded until 4-3 with few turns. Throughout the early going, Texas couldn’t contain Verzuh’s firepower — she scored Princess Layout’s first three points — while Dartmouth contended with the Texas handlers’ speed. Jaclyn Verzuh and Julia Schmaltz weren’t bothered by the mud. They gave the crowds what they wanted by matching up on each other during every point that they were both on. Schmaltz played admirable defense, but she had a tall order. Verzuh got a lot of separation downfield throughout the game, particularly on the breakside. When Texas had the disc, this matchup created an offensive vacuum that other Melee players stepped into. With Verzuh focused on shutting down Schmaltz, Texas’ Laura Gerencser had the chance to take over. She had 3 goals, 3 assists, and 1 block in the final. Dartmouth threw zone once early in the first half, which Texas sized up, laughed at, and destroyed by quickly bouncing the disc between handlers and poppers. For the rest of the game, Dartmouth didn’t try anything fancy on defense. Instead, Texas Melee gave Dartmouth chances to break. Texas’ Dre Esparza had several key drops in the first half. At 4-3, in the game’s longest point with seven total turns, Dartmouth converted a Texas mistake into their first break on a beautiful huck from Julianna Werffeli to sophomore Caitlyn Lee. Many teams would let Dartmouth have the game right there. You’re not generating break chances, you’re making mistakes, meanwhile Verzuh’s heart rate has barely passed 100 BPM. Instead, Texas exhibited the same mental strength that brought them back into their Michigan quarterfinal game and that won them the semifinal. They matched Dartmouth’s break immediately, holding quickly and then converting their first break chance to tie the game once more, 5-5. But Dartmouth broke right back, with another Zhu to Verzuh connection for their hold before a perfect dime from Verzuh to Piper Curtis earned the break and half, 7-5. The dominance of Jaclyn Verzuh and Angela Zhu during this final cannot be overstated.1 Verzuh had 6 goals, 3 assists, and 1 block while Zhu threw 7 assists — six of which were to her favorite target. The former played 11 of the first 12 points, and both women played the first seven points of the second half. Werffeli had a less dominant final than Zhu and Verzuh on the stat sheet, but she remained one of the team’s most reliable defenders and logged heavy minutes. Dartmouth broke twice in a row in the second half to increase their lead to 10-6. Both were one possession breaks, pushed by a fearsome offensive intensity after the turn. Three of Dartmouth’s four breaks required only a single possession to convert. Verzuh had her way with the field, cutting, throwing, jumping, and diving with the confidence and ease of an elite player ten years her senior. Texas didn’t panic, even in the face of a growing deficit. If anything, trailing to Dartmouth focused their top seven’s play. Esparza found Schmaltz for a hold — Esparza’s third assist and Schmaltz’ third goal of the game — and they broke soon after by locking down on the Dartmouth handlers. They still trailed 10-8, but it was a start. Texas broke again after the teams traded holds, bringing the score to 11-10 and glimpses of what their first half could have been shone through. Melee applied pressure to Zhu with flatter marks and tougher reset options. They put more bodies into the cutting space during Dartmouth’s isolation pull play. On a turn, they opened the field with long breakside swing passes and easy give-and-go momentum. Handlers threw calculated risks to cutters who were ready for the tougher grab. Melee’s O- and D-line have a lot of crossover, and their versatility showed late in the game. Still, the comeback wasn’t to be, as Dartmouth and Texas traded to close out the game. Even as they surged in the second half, Texas didn’t have an answer for Dartmouth’s brutal redzone composure. If Dartmouth was within 15 yards of the end zone, they were scoring. Dartmouth’s Big Three are heavily discussed with good reason: they were involved in 12 of Dartmouth’s 13 goals, and only two other women — Piper Curtis and Caitlyn Lee — added their names to the stat sheet. So it was oddly fitting that in their final point, Curtis sent a tidy flick huck to Lee for the score and the game, 13-11. Comments on "Dartmouth Pushes Past Texas In A Gritty Stanford Invite Final (Women’s)"